Ho-ho-how awesome it is to be back on the Eclectic Home Tour series—winter edition!! Jolly thanks to Jess Rey at Domicile 37 for inviting me onto this talented, holiday-inspired blog hop. 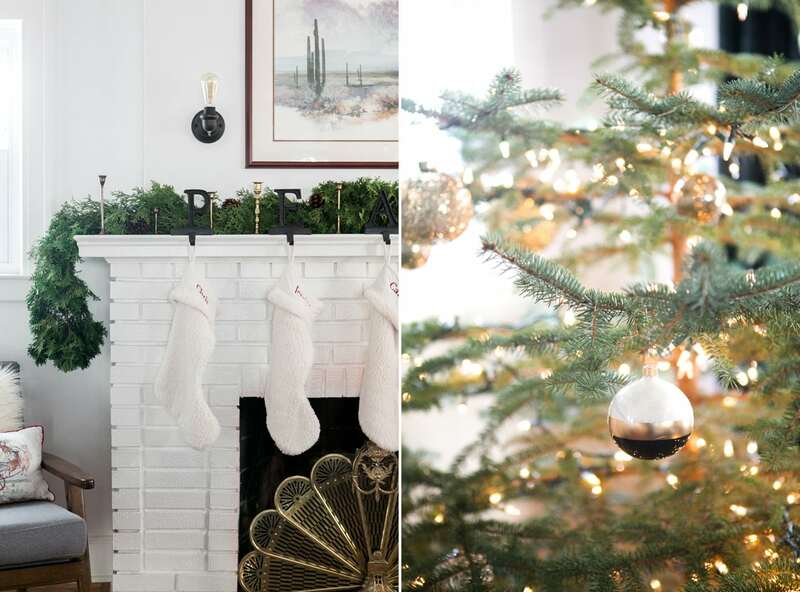 There’s a link to all home tours at the end of this post, so be sure to visit all of these fabulously festive ladies before you’re off on your merry way! Christmastime makes me so nostalgic. I grew up in a home with an off-the-boat Italian grandmother who reigned Christmas like no other. Outside, inside, ev-ery-where! 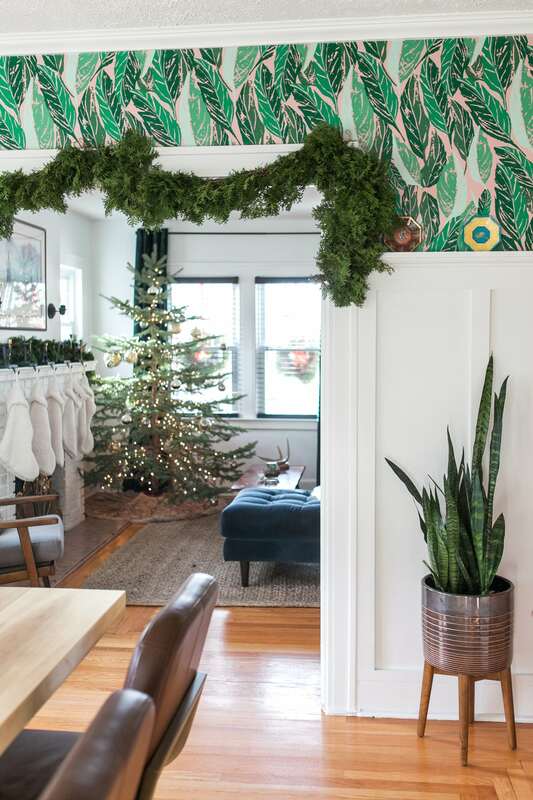 I’m not big into the oft-seasonal decor switcheroo, so my youngster experience is the reason for my season and why I change things up in the Brigham Craftsman for a single month’s time. 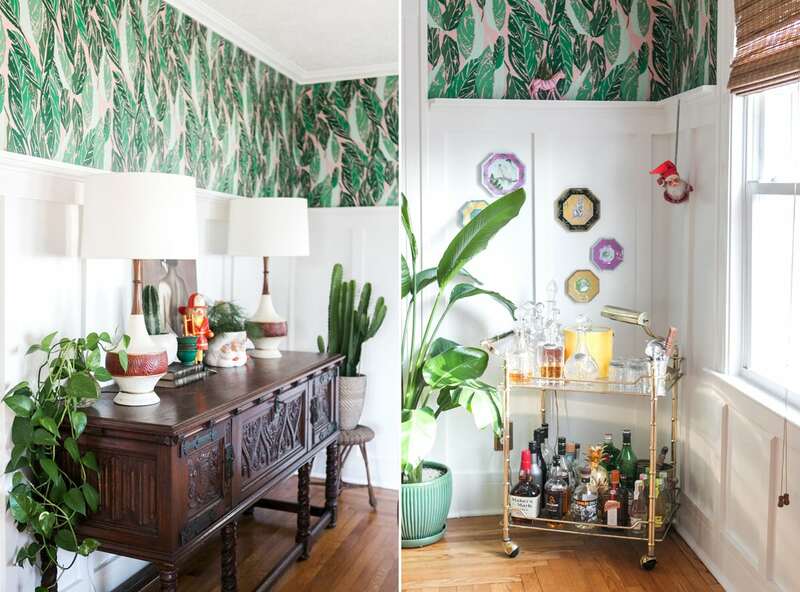 It’s my first time decorating in my wildly redesigned home. It’s made the process a little tough, but resilience is key in this house! Most of my previous decor was aligned with my coastal / rustic roots. I opted to keep my decor (somewhat) minimal by adding pops of color with my favorite vintage Christmas collections. I also adore my Article sectional sofa even more because of how gosh darn good it looks rearranged. I finally achieved the classic “tree in the window” look. For the past four years, I’ve made all of my fresh wreaths and garland. 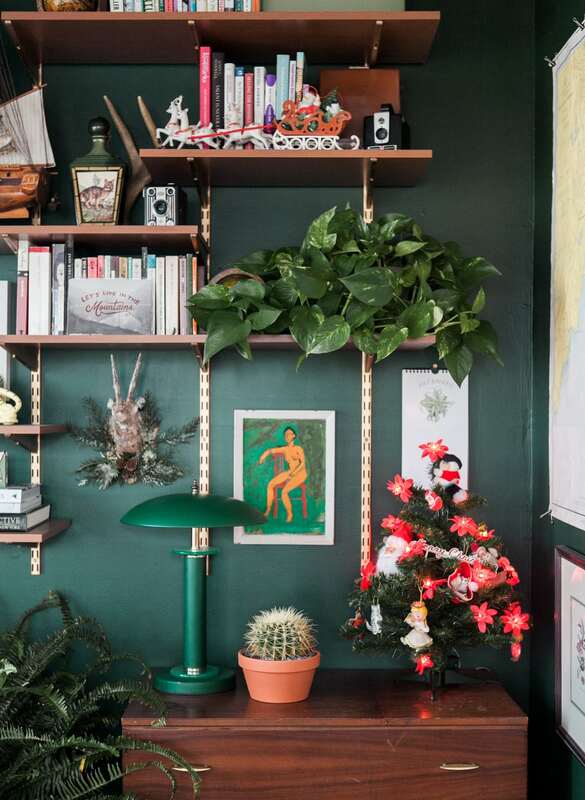 This greenery is so aromatic and adds such a classic holiday feel. 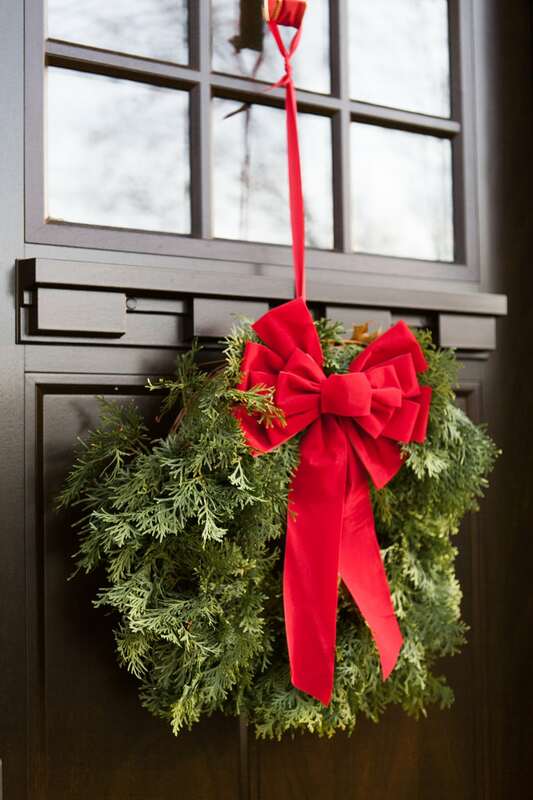 I pull the good ol’ New Englander card by donning wreaths on my front windows and door with red ribbon. One day I’ll have a vintage Santa and reindeer blow mold flying from my hour to the street. One. Fine. Day. As if it wasn’t dark enough in the winter, every time I pluck those wreaths off I have the intense desire to shout from the rooftops: LET THE LIGHT SHINE IN. 😂 On the flipside, I absolutely love seeing them from the inside. If there’s anything minimal, it’s the Christmas tree!! I won two live trees at a fundraiser earlier this year. Turns out the trees were from an aspiring Christmas tree farm on a friend’s private property. Let’s just say I found the Charlie Brown tree of my dreams. I might have to make private property Christmas trees a thing. Legally, of course. I sprinkled Charlie with glittery gold ornaments and a brown faux fur tree skirt for a proper finish. We have a beautiful red cast iron tree stand, but proportionately it was not working on its own. If I had time to make or found the perfect garland, I would’ve added that, too. My husband missed the tree topper, so she’s donning a shiny gold star now. I totally like it better. Minimalism is hard. 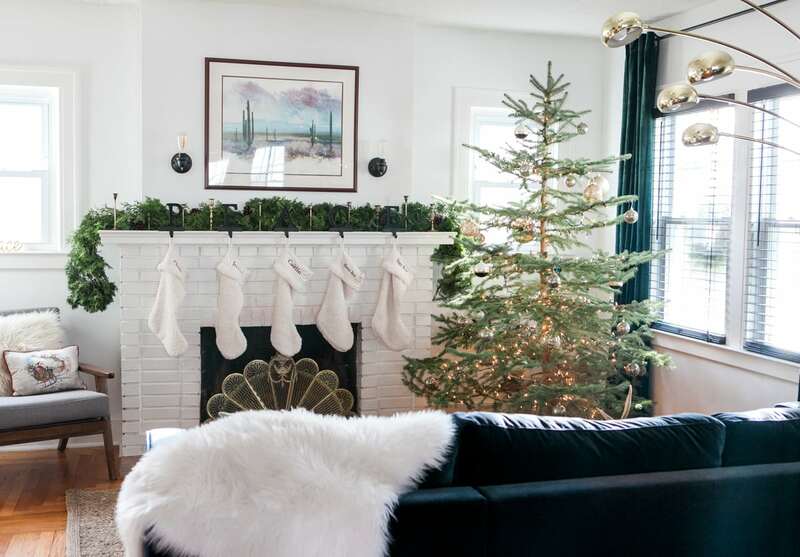 The mantel is always my favorite to decorate—white stockings, greenery and brass candlesticks. How can you go wrong?! I’ll close off the sconces as soon as I find my future large, arched gilt mirror. I’m looking for you, boo. I decked out my shelfie by adding a few nostalgic pieces from back in the day—the vintage red flocked santa sleigh and reindeer (one of two) and my mini childhood Christmas tree. I love the faux reindeer head as well. I found him at a thrift shop for one fat dollar. I do wish I had more greens to drape in this room—a skinny white pine garland of sorts. It would’ve worked so well with the Hunter Green. Nevertheless, it puts a reminiscing smile on my face everytime I look over at the blinking poinsettia lights. They’re older than I am and just so goofy!! After seeing Christmas cacti like Jen’s (@blissfully_eclectic), Myrtle had to get draped with string lights. I usually go all soft-white light, but thought my hubby would like a little colorrr. He continues to petition for multicolored lights. Ya give an inch, they take a mile! Here’s where a few of my MCM Christmas collections shine. Over the bar is a vintage, spring loaded Santy Claus (another one of two 🙈). He came from grandma’s house in Queens. He’s a little bit creepy and 100% hilarious. 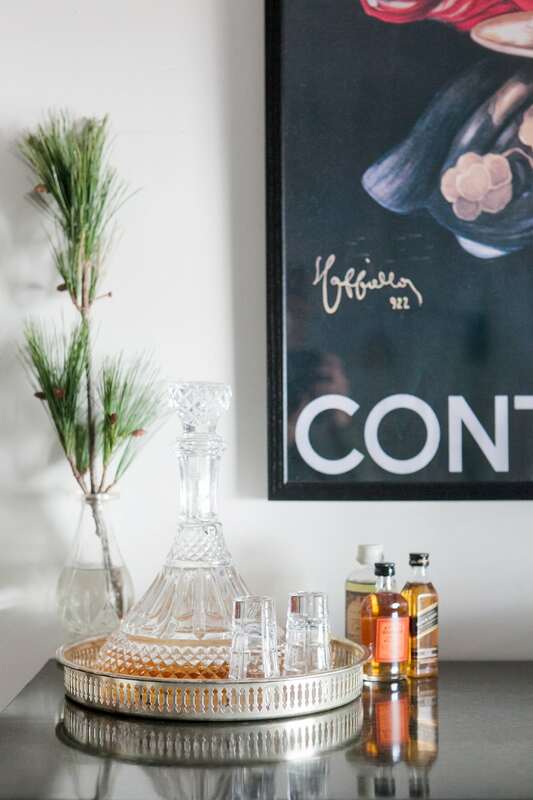 It gives good ol’ Christmas whimsy to our Hollywood Regency brass bar cart. Finally, I draped my fresh, eight-foot long arborvitae garland over the entryway. 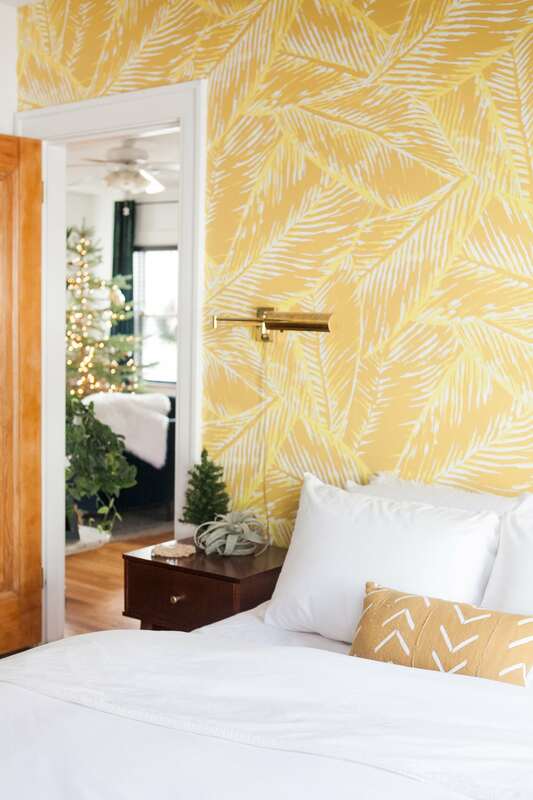 I love, love, LOVE the way it looks against the Justina Blakeney + Hygge & West wallpaper. And it looks damn good peeking out on the living room side, too. Soon I’ll set our Christmas Day table with my grandmother’s china, brass candlesticks and lotsa eucalyptus. SO PRETTY. 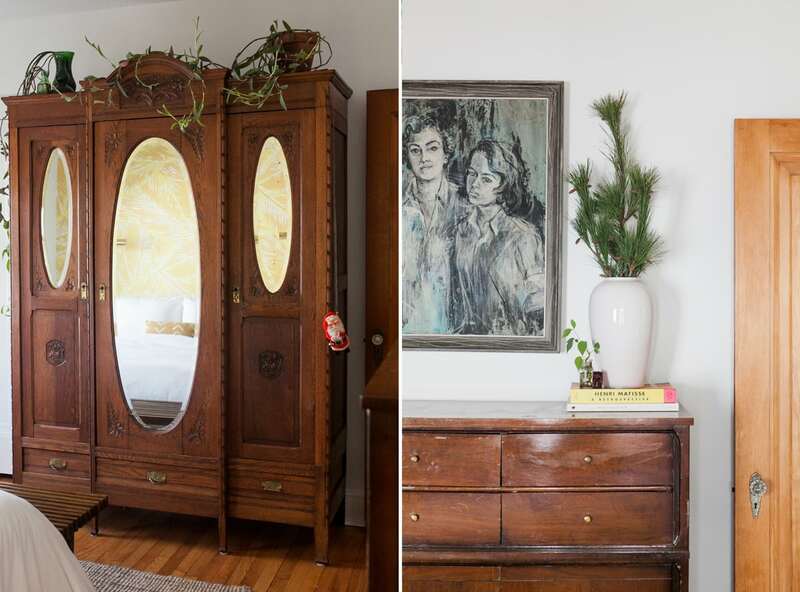 I kept this room simple by adding a few pops of fresh white pine cuttings on my dresser, a teeny-tiny, faux tree and the second spring loaded Santa. This one permanently lived in my childhood laundry room so he’s a bit stretched out. He’s also the more conniving-looking of the two and unofficially our Christmas home protection system (I might run if I saw voodoo Santy Claus 😂). On the flippity flop, waking up to the view of Christmas tree twinkle is da bomb. A mini reveal! I’ve been teetering in our downstairs guest room for two months. The room came alive when I recently received my grandparents first bedroom set they bought when they got married 60 years ago. The gaudy-licious, black deco set makes my heart go pitter-freaking-patter. It’s not nearly done, but she’s shaping up to be a star. 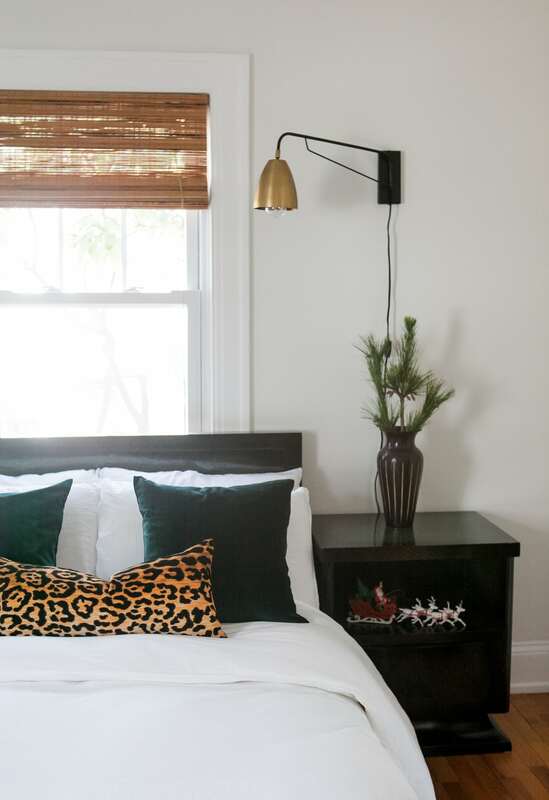 The best part: 90% of this guest room is thrifted. I bedazzled our guest room’s holiday spirit with fresh cut white pine branches and the second 1950s-era red flocked Santa and reindeer figurines. They’ve always made an appearance somewhere. I just crush hard on them. Also, every guest room NEEDS a bar. Non optional here. There you have it, fraaaands! My holidaze decor. I so appreciate you popping on by. 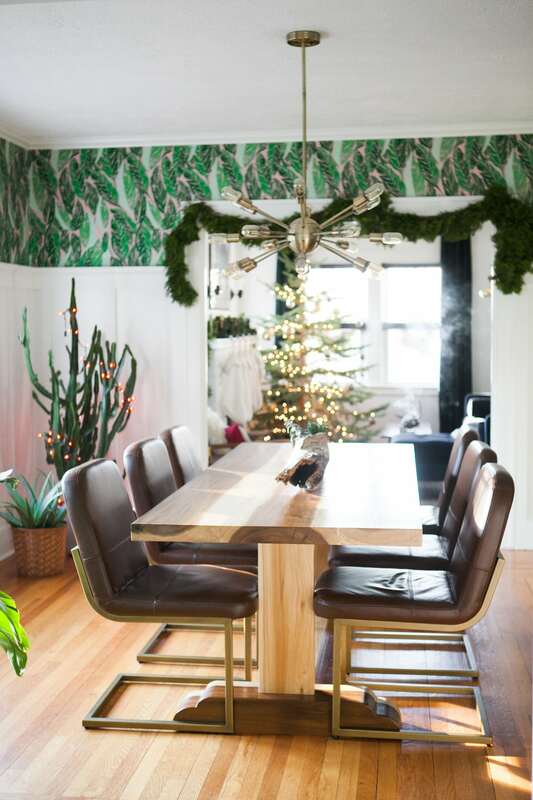 Keep moving along the holiday decor train: Next up is local gal pal, Diane of The Rath Project. 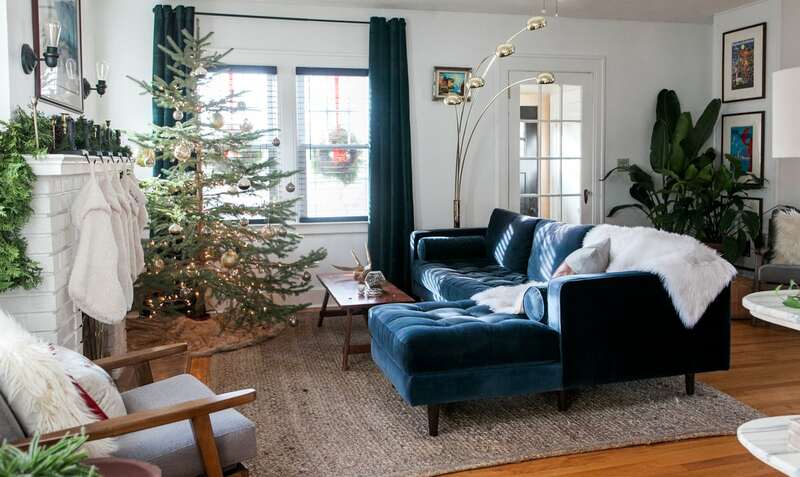 With her flair for the eclectic, this is surely one holiday home tour not to be missed! 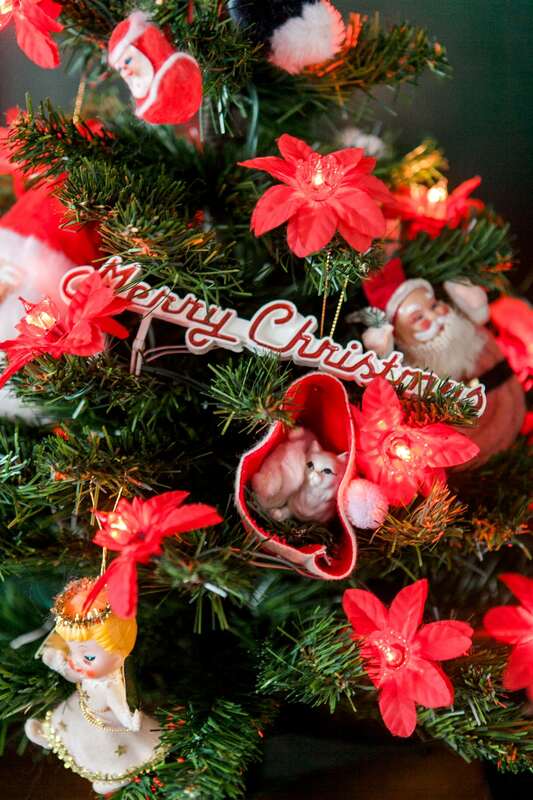 Do you collect vintage Christmas decor? Cocktails in every guest room?! DIVULGE IT ALL IN THE COMMENTS BELOW!! Dang, girl! You have got it going on for real. Your home belongs in a magazine and your photography is out of this world. Beautiful tour! if i could move into any home on the internet, i think it would be yours…. just LOVE it! Oh wow!! You really spread the cheer around it looks so good everywhere!! I must admit… That tree, is amazing! It really is perfect! 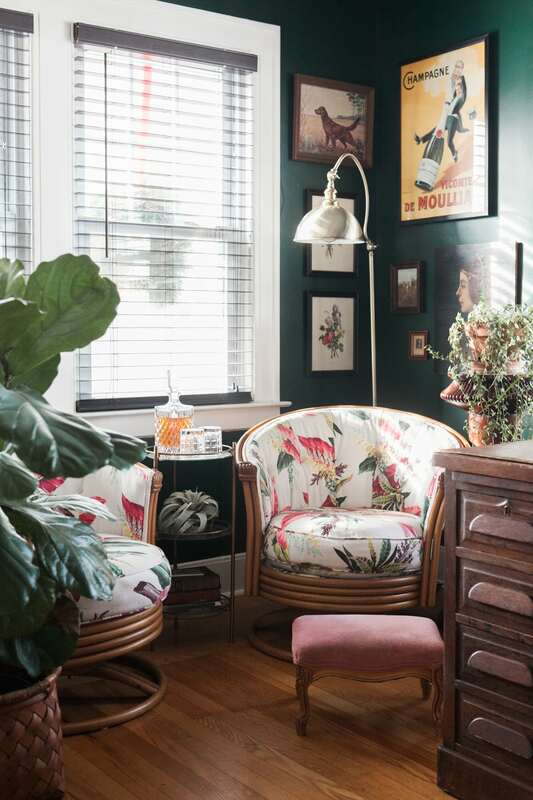 I love your style and all of your little vintage goodies! I never get tired of seeing your office either! That green is so good! Loving the upscale holiday touches! Love ALL of your vintage , thrifted, and Charlie tree decorJessica! I ‘m going to have to add bar to guest room must dos! All the santas look so cherry and festive. I really enjoyed seeing all of your home! Can’t wait to see your Christmas tablescape. Merry Christmas! Oh I love that you’re feeling me on the bar, Kathy!! Critical to guest happiness, of course. 😆 Merry Christmas to youuu! !